Contrary to popular belief, I am a bit of a couch potato. I just want to lay down somewhere, read a book, watch videos about dogs on YouTube, or have witty bants with someone in person or over the phone. If I have all or some of these, I’m typically good. 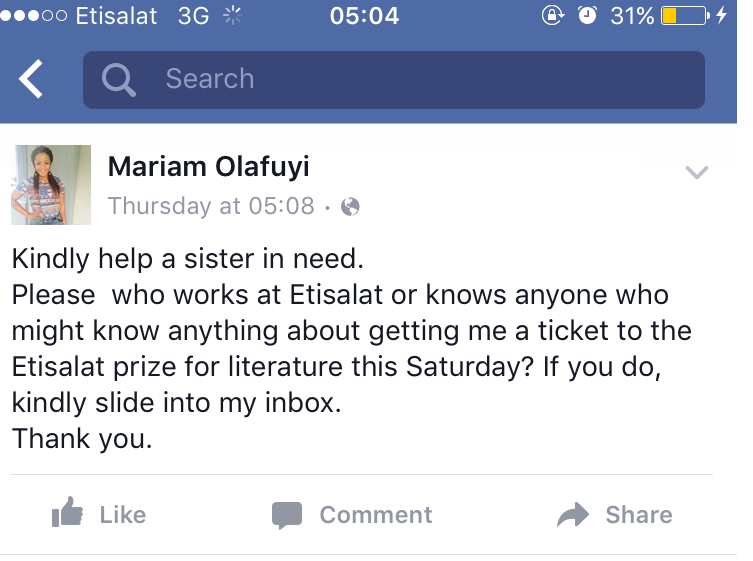 However, on Thursday the 17th of March, at 5:08 AM, when decent people were still asleep, except of course they live in Lagos, I put out a plea for “hep” because I wanted to attend the Etisalat Prize for Literature. I don’t actually consider myself a writer because I think owning that tag requires a lot of boldness, deepness and sometimes, a dash of weirdness (or uniqueness if you want to be polite), and I’m not sure I possess all these qualities in adequate measure. However I thought to myself, “if you are too chicken to call yourself a writer, won’t it do you some good to be in the midst of literary giants? Maybe by osmosis, you might get some of their qualities and realize that the writer tag is not for a few.” So I made a decision that I was going to attend the event, but there was a little snag, I didn’t have a ticket or know how to get a ticket, and the event was strictly by invitation. So I began a quest to get tickets, and I sure did learn a great deal along the way. By the time I embarked on my quest, the show was only two days away, so I did what came to mind first, I asked for help on Facebook. I mean, surely one out of the 3,674 friends I have must know someone who can get me a ticket right? Of my 3,674 friends, only one slid into my inbox to help me get a ticket (thanks babe!). Unfortunately her contact was unable to help. So I took my destiny off social media (who social media don “hep” sef… oh, except Olajumoke and oh… Oresegun Olumide... my, apologies) and decided to reach out to a colleague who used to work at Etisalat. She promised to get back to me, but by Thursday evening, she didn’t have promising news. I was disappointed because I didn’t have a ticket and the show was drawing closer, but at the same time, for some strange reason, I was still very optimistic about attending the show. Anyway, on my way back home from a long day at work, after reversing “upandan” the whole Lagos, I saw a mobile advertisement truck. You know those trucks with huge screens that park at strategic locations and advertise stuff? Yeah, I saw one of them and guess what it was advertising? 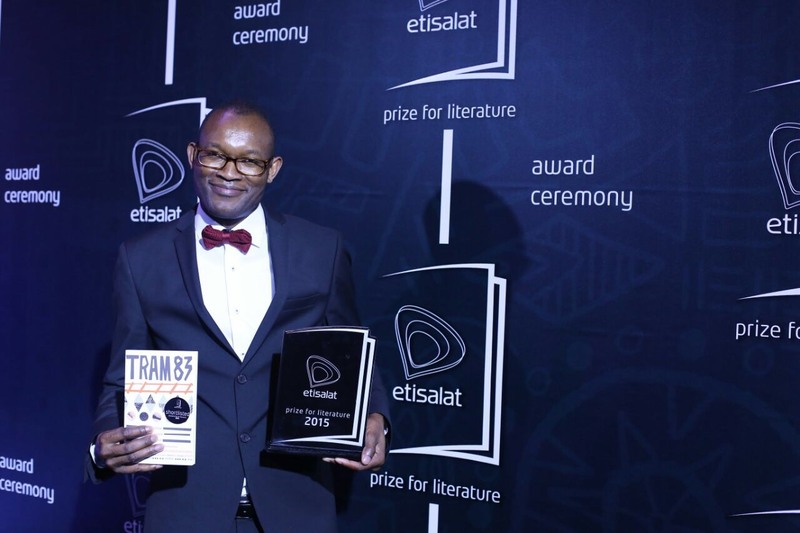 The Etisalat Prize for Literature! So I did what a desperate person would do. I parked my car, walked up to the guys who were in the truck and asked if they had a phone number for someone who works at Etisalat and might be able to get me a ticket. The guys in the truck were vendors of Etisalat, not Etisalat staff,. At first they looked at me as if I had disobeyed the elders, swallowed an orange seed and had an orange tree growing from my head, but in the end, they were gracious enough to give me a phone number. With the speed of Usain Bolt, I dialled the number, explained my predicament and the poor guy on the other end of the line just said he would see what he could do. You know, at that moment, despite the fact that I did not have a ticket, I was so proud of myself. I was proud of the level of desperation that moved me to make unconventional moves. I typically don’t like to ask for help, favors and so on, and you know what, I have recognized this as a PROBLEM. I am quick to say “I can sort this out by myself,” and I will refuse ready and willing assistance. This is something I am working on, and hopefully I will get better with practice. So I was proud of the fact that I asked for help on Facebook, called in a favour from my colleague and even harassed a guy whose face I have never seen and will probably never see, just to get a ticket. Anyway, as Paulo Coelho said “And, when you want something, all the universe conspires in helping you to achieve it.” The universe indeed conspired, and at noon on Friday, I got an email-invite, facilitated by the unknown contact at Etisalat. As if that was not enough, at 5:08PM (okay, I’m lying, but around 5 PM sha) I got a call from my colleague to pick up a ticket. This is how my friends, I got two tickets to the show! This might not seem like a big deal to you, but oh boy, did I learn some big lessons from this experience. I hope I can pass the message across well enough. See, what would have happened if I did not give it a shot? I would have had a regular couch potato day. If I did not have the desire to go for the event, the universe could not have helped me out at all. If I did not dare to try, or let me take it up a notch, dare to dream, I would never have known I stood a chance. This experience inspired a Facebook post that has been liked almost 100 times and shared about 20 times, which I shall share here in due course. This may not be your definition of viral, but for me, it made me realize that a lot of people could relate to an important message, which is that we defeat ourselves before we try. Typically, I would have said “I don’t know anyone in Etisalat” or “It’s already two days to the event” or “How will I be begging for tickets on Facebook” or “I can’t park my car and talk to these strangers, they will think I am weird”. Screw those excuses! Screw them! If you want something, you had better get your behind up and begin to think about it, dream about it and do whatever strange thing it takes to get it (cough, whatever legal thing it takes to get it. lol!). This is a lesson I am still learning, but I am hopeful that this experience can inspire you to do the unconventional while searching for what you want. I hope this little story has inspired someone, and of course, you deserve to see pictures now. I tried to slay. Hope I tried? lol. You know I love to read from you. Do you have a tough time asking for “hep”? Have you done unconventional ( and legal) things in a bid to succeed? Please share. You also deserve to see pictures, so here we go! If you haven’t seen this painting online. I can’t “hep” you. Have you been living under a rock?